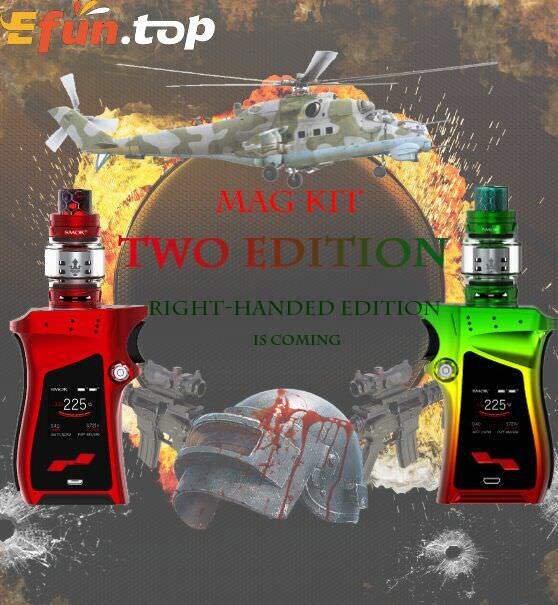 SMOK MAG KIT Twins, Left & Right Hand, So Funny! So funny kit I must to let you know, SMOK is more and more creative on producing item. We have recommended the SMOK MAG Kit to you, if you notice it carefully, it is a left-hand design,so it is difficult for other people. Now, we have the right-hand edition, two editions can satisfy all people. Do you want to try one or two? Here comes the latest SMOK MAG Kit! It consists of a new MAG box mod with a TFV12 Prince tank. Powered by dual 18650 batteries, the MAG fires up to a maximum output of 225W. MAG features unique Lock N Load design for battery installation. Along with its gun-handle appearance, unique flower-shaped button and trigger-like fire key, it feels like a real gun in hands! The updated HD UI provides an easy operation system too.